The anthropological history of PNG is fascinating, but this is a page about coffee, so: Germans and British colonized Papua New Guinea in the 19th century, with the Germans toward the north and Brits in the south, where they planted coffee in and around Port Moresby in order to sell it to the Australian market. In the 1920s, commercial coffee production was increased through the introduction of Typica coffee from Jamaica, a variety commonly known as Blue Mountain. As was common in most coffee-growing areas of the Pacific Islands, most of the coffee production was from a handful of large European- or Australian-owned estates, with labor coming from the local indigenous population. Today, while there are still estates and plantations, the majority of coffee production comes from smallholder farmers, each with around 1–2 hectares called “gardens” in which they grow small amounts of coffee as well as whatever else a family or community might need for use or sale. 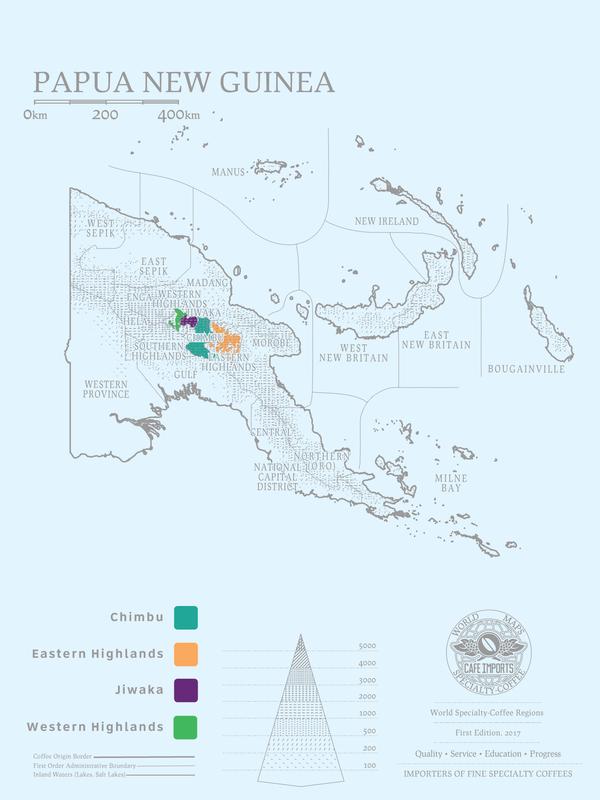 Less than 3 percent of the country is used for commercial agriculture, and forest makes up more than 63 percent of Papua New Guinea’s landscape. One of the unique characteristics of the coffee market in Papua New Guinea is the grading system used here, which measures not simply screen size as in other countries (like Kenya or Colombia), but also bean shape, color, cup quality, and presence of defect. Since 2012, Cafe Imports’ senior green-coffee buyer Piero Cristiani has made the long trek to PNG to develop relationships, cup new coffees, and to continue to seek means of developing and investing in the specialty production in the country, despite the complications of culture, language, and economics. Our primary partner in PNG is the exporting company Monpi, and through that company we have sourced coffees from individual washing stations and communities such as Kujin, Namugo, and Ulya, as well as through the FTO-certified cooperative Keto Tepasi, located in the Chivu region. Piero is actively working toward developing a microlot program in Papua New Guinea, which would allow us to offer individual day lots from the washing stations such as Namugo, and potentially reward farmers for quality while also encouraging them to make investments back into their production, picking, sorting, and facilities.